Leicester will play Barcelona and Paris St-Germain in this summer's pre-season International Champions Cup. The Premier League leaders will play Celtic in Glasgow on 23 July, PSG in Los Angeles on 30 July and Barcelona in Stockholm on 3 August. 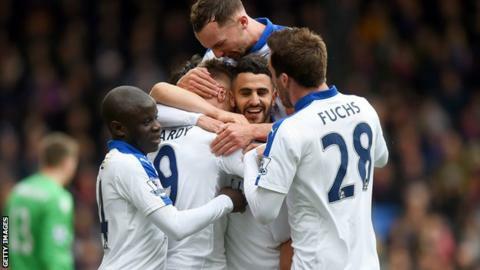 The Foxes are among five Premier League clubs taking part in the pre-season tournament, based mainly in the United States. Liverpool face Chelsea at the Rose Bowl in Pasadena on 27 July. The Reds will also play AC Milan in Santa Clara in California on 30 July and Barcelona on 6 August, at a venue to be announced. Chelsea play Real Madrid on 30 July at a venue also not yet announced and then travel to Minneapolis to play AC Milan on 3 August. The 10 teams in the main competition also include Bayern Munich, while Manchester City and Tottenham Hotspur will play standalone matches in China and Australia, respectively. Meanwhile, Manchester United will take part in an eight-day, two-game tour of China this summer, where they will play Manchester City in Beijing. The Premier League season will start later this year - on Saturday 13 August.